As every firefighter has probably been informed, the correct stretching of the attack handline is of critical importance. 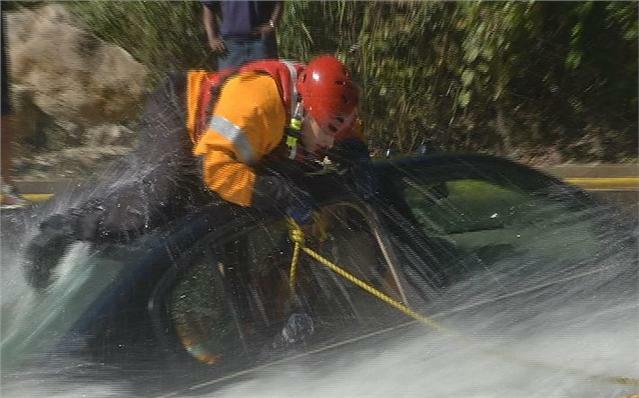 The incorrect stretching of a handline, should be immediately noticed and corrected by a firefighter on scene. Anyone who witnesses a line being stretched incorrectly, HAS THE RESPONSIBILITY to correct the nozzleman after the fire. There are many aspects to be considered when stretching; however, this discussion is about the correct way to finish the stretch. 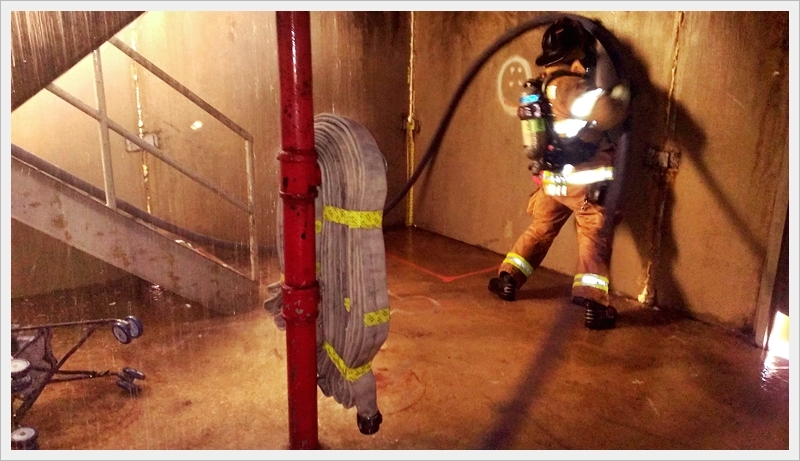 The nozzle firefighter will stretch, flake the line, and place the nozzle at the door; these three aspects are correct, but they do not complete the stretch. It is of vital importance, after placing the nozzle, that the nozzleman bring the first fifty foot coupling to the door. When the coupling and the nozzle are at the door; fifty feet of hose is available, to ease in maneuverability and to prevent the coupling from getting caught on obstacles in the front yard. Fifty feet of hose will typically reach all the rooms, in common style homes. If you observe a line being stretched incorrectly, or a nozzle team preparing to enter, without the fifty feet (working length) at the the door, YOU NEED TO CORRECT IT AT THAT MOMENT. Take the time to get the coupling in the correct place; this will help to insure the nozzle team is not delayed in reaching the main body of fire. 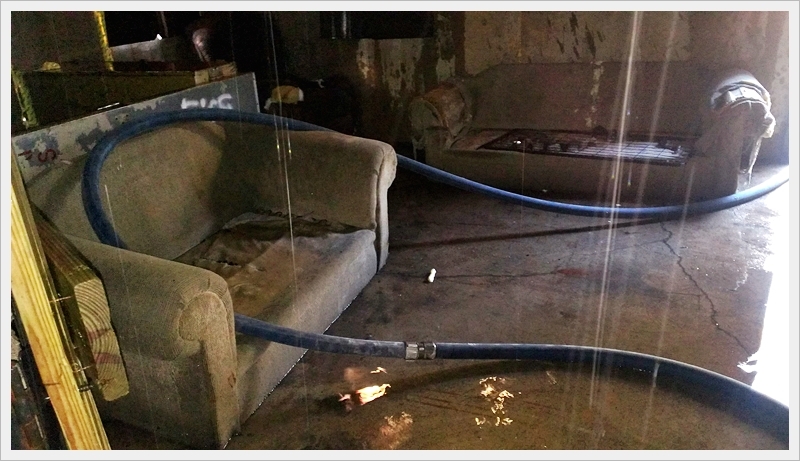 Things to consider with a delayed hose team are: (1) fire will travel towards the door the team entered, increasing damage and fire intensity ; (2) conditions inside worsen for firefighters and possible victims ; (3) instead of backing up the nozzleman, searching, or checking fire conditions- the backup man is now tasked with mitigating unnecessary problems. 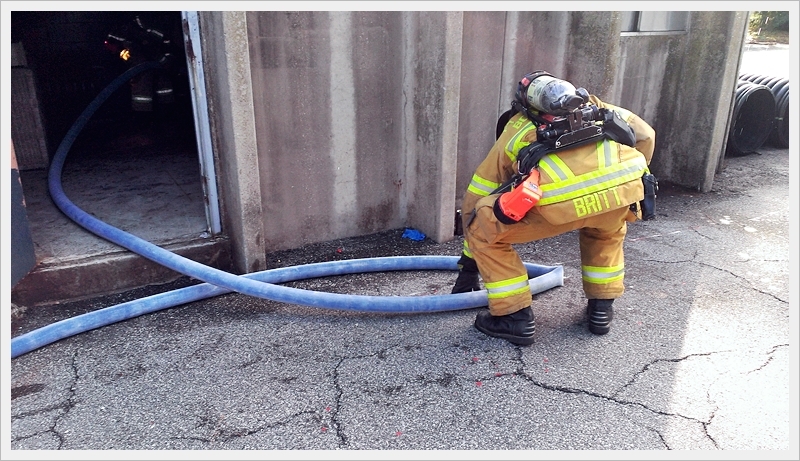 If you witness an incorrect stretch, you need to speak to the nozzle firefighter and explain the mistakes. We have the job of holding each other accountable. I see two common problems on this job today: (1) Some firefighters will not take responsibility when they are wrong ( “it is someone else’s fault”). (2) Some firefighters are afraid or unwilling, to correct someone for a mistake. You need to be an adult, when you screw up- step up. No one has a right to say one word about something that is wrong, if they are not willing to say it to the person who is doing wrong. Your ISO rating could be slipping right out of your hands if you don’t take action to correct it. Your ISO rating should be important to you and every member of the department. Your ISO rating is a good barometer of how effective you are at putting out fires. Your ISO rating is your “Interior Stream Operation”. If you’re not so hot with a nozzle, then your ISO rating will go down in flames and the fire area will go up in flames. Being part of a solid engine company is not only reassuring, it is the baseline of your extinguishment culture. 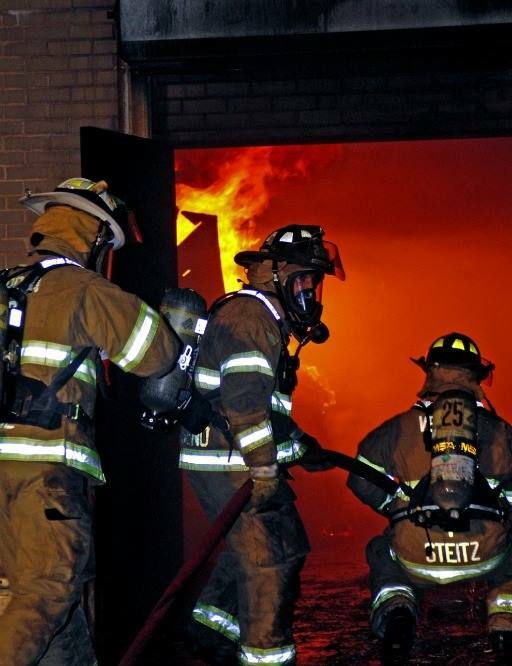 An excellent engine company operation is not created out of thin air; it comes from dedication and hard work. The firefighters that make up a highly effective extinguishment team, besides having a shared dogged determination to defeat the fire where it lives, will incorporate solid nozzle techniques along with proper hoseline management. As a friend of mine stated, “You can flow 200 gallons per minute, but if it’s going straight into a corner, it’s not doing much.” So true! The variable to all fire operations is the human element. 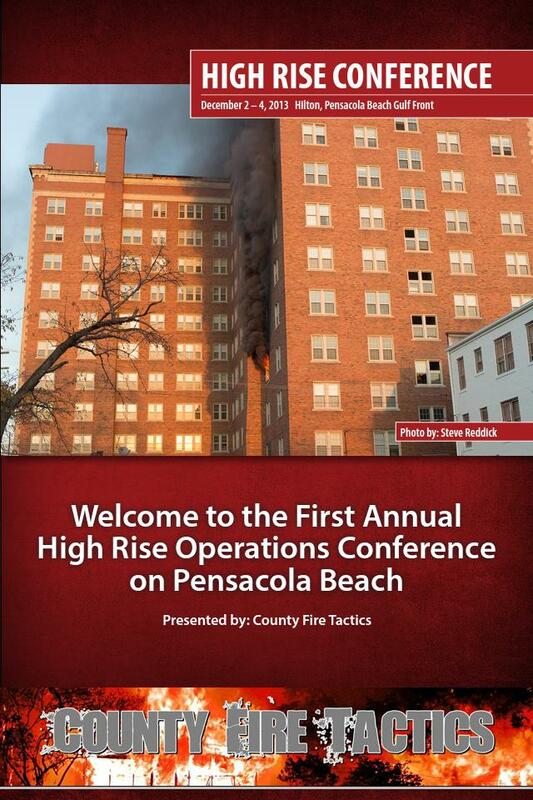 Taking two similar fires with two different crews may not produce the same outcome. That outcome also varies between firefighters and bosses; however, firefighters and their bosses can not hide. They either accomplish the task or they don’t. They can, of course, make excuses to justify their lack of performance for those that will listen. 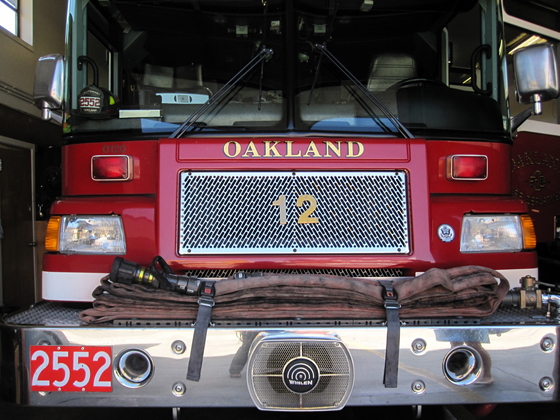 The odds that are stacked against a nozzle team can typically be successfully challenged by a reliable flow, rapid engagement and effective leadership. So now you say, we don’t have a lot of fires, and I say that doesn’t get you off the hook. 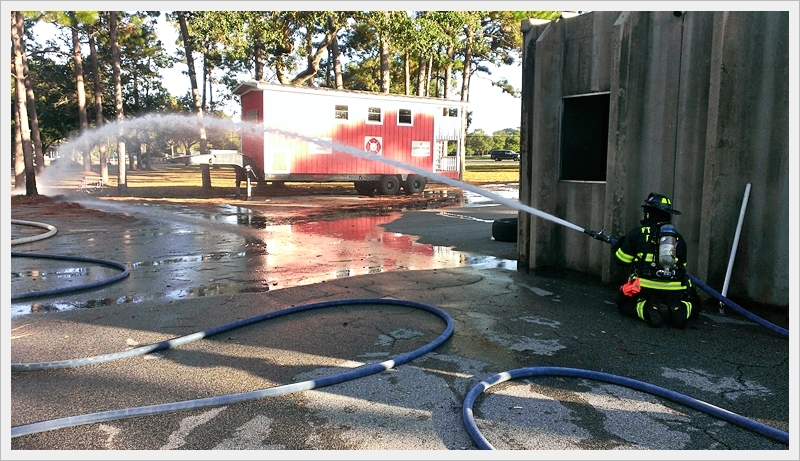 Every aspect of firefighting can be closely replicated in training and with education. If you feel that you need more training, then seek it out. Departments that work to discover their shortcomings and work to resolve them are in tune with the foundational principles of service. Remember that fire drills are not just for schools; they are for fire departments too. Your personal Interior Stream Operation (ISO) should be deliberate and efficient. You should learn when to open the nozzle and when to shut down. You should understand how to properly hold the nozzle so that your movements are fluid and are performed with the nozzle out in front of you. 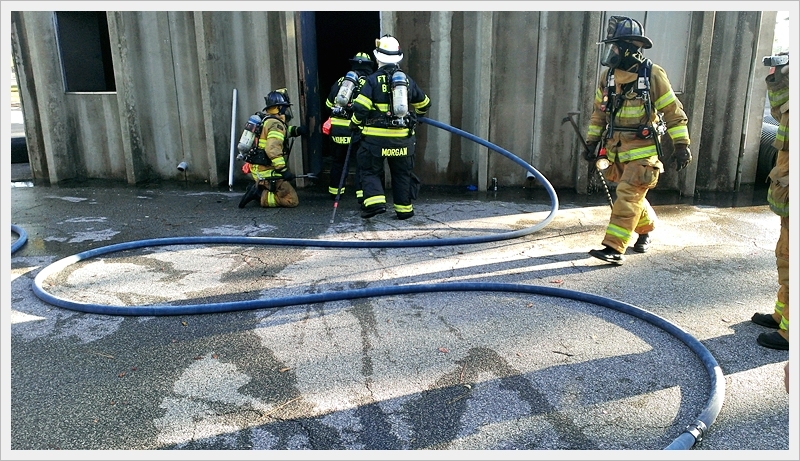 You must clear any area that you crawl through and understand when the nozzle should be up and when it should be down. 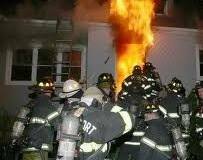 You should avoid nozzle drop while advancing and understand that you and your teams skills can make or break the fire. Improving your ISO is harder than making excuses, but the payoff is much more satisfying. 1 ¾ for Commercial Attack……Why Not? City of Fort Walton Beach Fire Dept. Fla.
Now that I have your attention, take a moment to read this and provide feedback. Couple of disclaimers; I’m not a writer so please be kind and I’m not advocating the use of 1 ¾ for commercial fires, but rather reaching out to those who are knowledgeable in this area and asking for feedback. Recently during flow testing apparatus in my department, an engine company approached me and asked me a question. “What do you think about flowing and operating a 1 ¾ line flowing 260 GPM in place of 2 ½ line flowing 260 GPM?” You can imagine my response….”No way, we don’t use 1 ¾ for high flow GPM and we certainly wouldn’t use it to replace a 2 ½ line on a commercial job.” As you can imagine this started a debate which led to much testing and this article for County Fire Tactics. I will make this as brief as possible. Firefighters had to work extra hard to manage the kinks in the line. They were never successful in removing all the kinks and this was performed in a drill tower where the obstacles are far less than an actual building. Kink management was difficult at best with the 2 ½ advancement. The hose team was never successful in managing all the kinks in the line. Keep in mind there were numerous pivot points for this advancement. Half the weight allowed the firefighters to move the line very easily, much quicker, and more efficient than the 2 ½. There was only 1 kink during the entire evolution which was easily corrected by a firefighter. Proper techniques were used by all especially the nozzle man and back up firefighter. This is a 1 ¾ line but absolutely has to be operated and staffed like a 2 ½ line when flowing 260 GPM. General assessment of the evolution is it was much easier to advance and the firefighters said they felt way less fatigued. They described it as no different than advancing any other 1 ¾ attack line. The nozzle man also stated that due to the smaller diameter of the 1 ¾ hose, he felt it was easier to hold and control the nozzle position. Bleeding the line checking the stream preparing to advance the 1 ¾. Although hard to tell by looking at pictures but the kink factor was decreased significantly. Notice the nice stiff bends in the hose in comparison to the pictures of the 2 ½ hose. 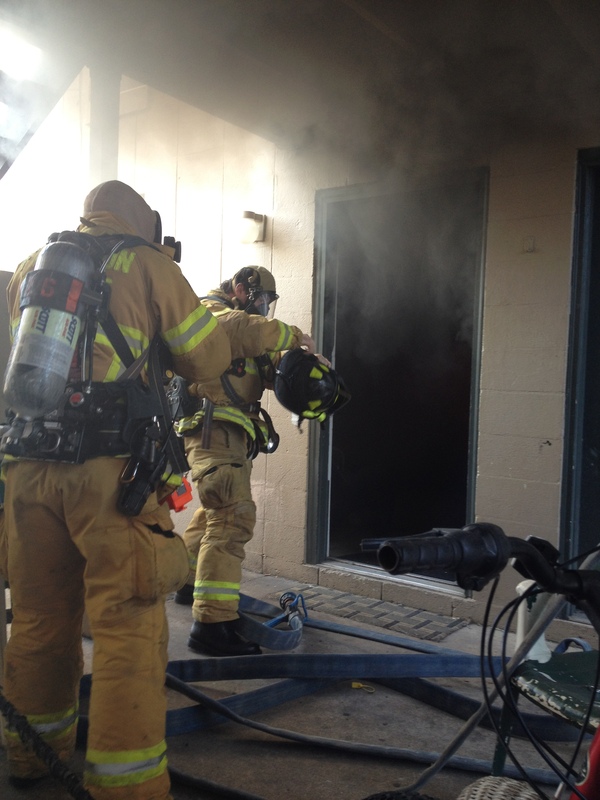 Wrapping the wall, stairwell, and rooms are essential with minimal staffed fire departments. 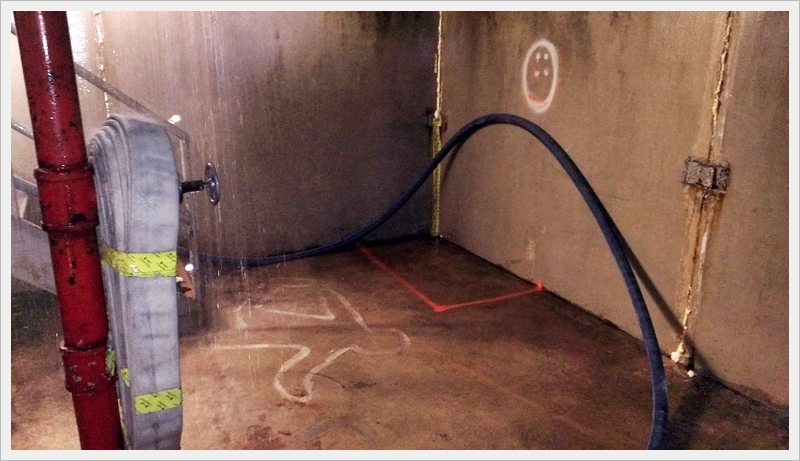 The 1 ¾ worked very well due to the high pump pressure. It never kinked when utilizing these advancement methods. However, 2 ½ would kink immediately rendering this technique less effective resulting in numerous kinks. Nozzle reaction for both the 1 ¾ and 2 ½ are virtually identical since the GPM and diameter of the nozzle are the same. Kink flow testing revealed that on average a kink in the 2 ½ hose would result in the flow decreasing from 265 GPM to 240 GPM. 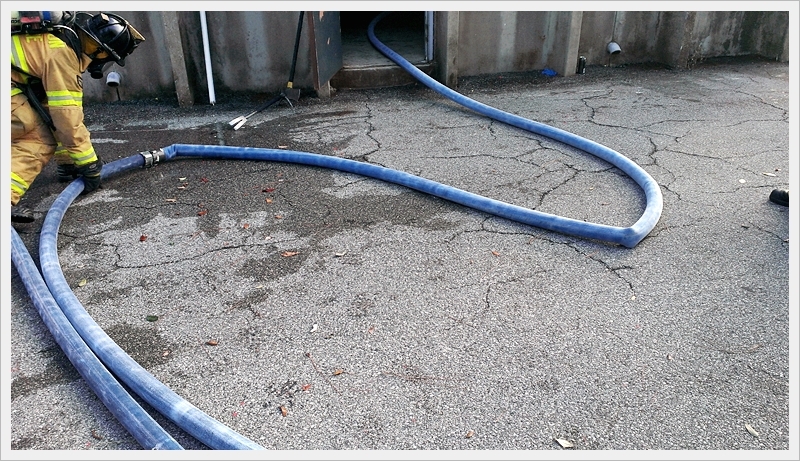 Kink flow testing revealed that on average a kink in the 1 ¾ hose would result in the flow decreasing from 260 GPM to 210 GPM. The significant decrease is obviously due to the amount of water flowing through a smaller diameter hose. 2 ½ hose was guaranteed to kink, 4 firefighters could not manage all the kinks resulting in a decrease average flow of GPM. 1 ¾ hose was extremely difficult to kink due to the high pump pressure. Only one kink that was corrected easily and quickly. The average GPM was around 250-260. Low friction loss hose was used (Ponn Conquest). 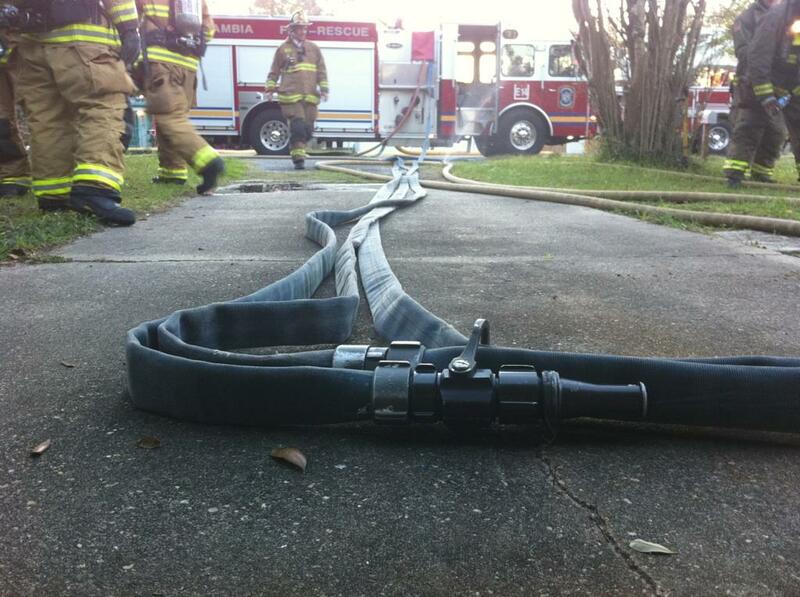 Anyone who is a student of the fire service understands the actual diameter of this hose is slightly larger that standard hose (or slightly larger than what the manufactures actually advertises it as); however, manageability of the low friction loss hose vs the standard hose is identical. It is likely that anything over 200 ft of 1 ¾ set up will not work due to high friction loss factors. This should not be considered in high rise fires due to high friction loss factors. This would include most if not all standpipe operations. If the 1 ¾ nozzle is operated too far out in front of the nozzle man, a serious “whipping or snapping” action of nozzle can occur. This is easily controlled by proper nozzle control and operation. A quick special thanks to my guys that insisted I take a look at this. Fort Walton Beach Fire Department Engine Company 7– Acting Captain Justin Westmoreland, Engineer Mark Birchett, and Firefighter Brandon Waterhouse. The testing we performed was much more comprehensive than what this article shows, but in an effort to make it brief and a quick read I stuck the meat and potatoes of the issue. In no way am I implying that we in the fire service move away from use of 2 ½ hose for large fire or commercial fire attack. However, the numbers and facts speak volumes that I believe are worthy of evaluating. If you think about it, this is no different from the evolution of 1 inch hose, to 1 ½ hose, to 1 ¾ hose, to low friction loss hose which now allows us to flow larger volumes of water under manageable conditions. I do buy into the concept of limiting your nozzle reaction and insuring you have a manageable line so the nozzle is ALWAYS operated properly during significant fire conditions-nozzle all the way open. This is why this 1 ¾ set up absolutely has to be operated as if it is a 2 ½ line insuring adequate staffing to insure correct deployment and operation. So I beg the question….what are we missing here? What’s your thoughts and/or experiences with high flow, smaller diameter hose? Should this be a viable option for large fire attack? Hard work, passion, and a little ingenuity is all you need to come up with fantastic company level training. You don’t need a big training facility to put on great training, you just need to use some imagination. 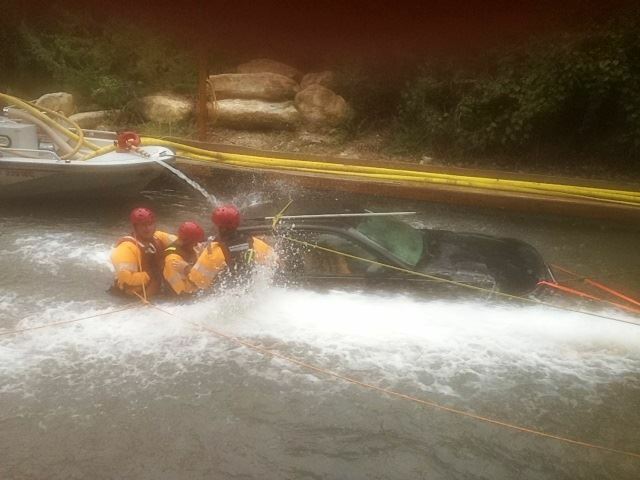 This is a prop that the Austin Fire Department in Texas put together for training their members in car removals in swift water rescue situations. 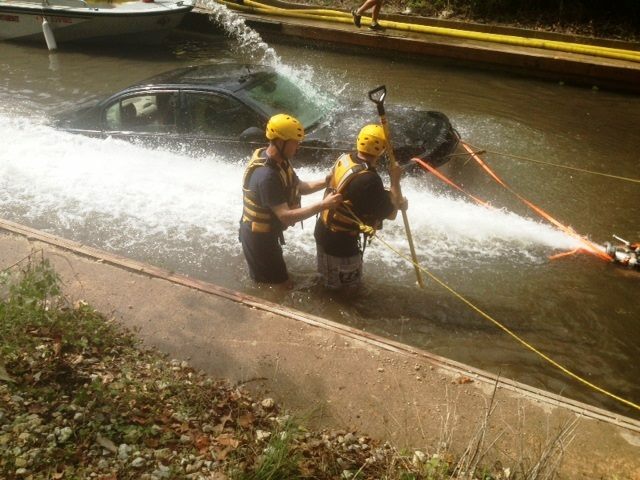 They put a car into a boat launch so that most of the car was submerged, they then used handlines of an engine company and a fire boat to cause the river like effect. This allowed them to preform various removal techniques in easily controllable situations. 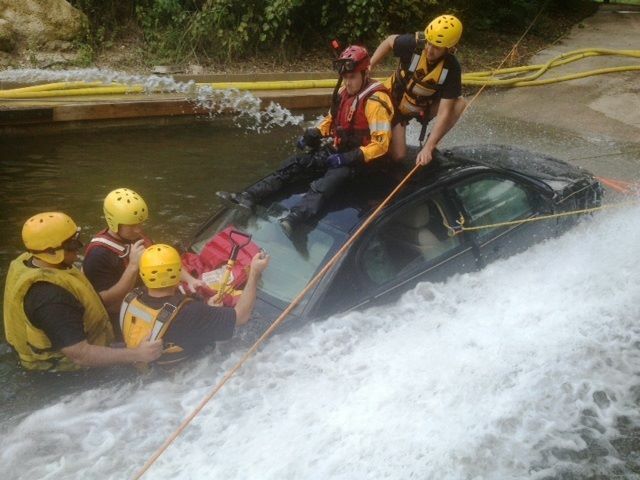 Not only does it get your members out doing swift water training but it also gets you out stretching hose, pumping your lines, ropes and knots, medical, setting up your ladder truck, and anything else that you wanted to put into the scenario. So get out their and push your training to the next level. 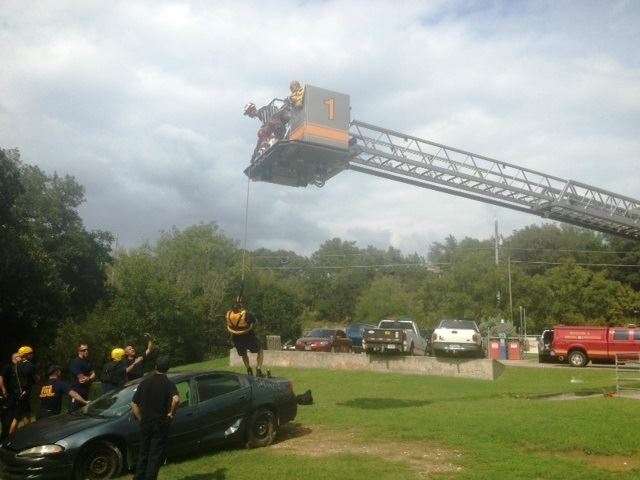 A serious “hat tip” to the Austin Fire Department on this training. We are nearing the re-launch of FireNuggets.com scheduled for January 2014. There has been lots going on behind the scenes as we’ve been moving forward with the transfer of so much valuable information from the legacy website to the new platform. This process has provided us time to read and reflect on all the great, great articles that have been written by so many of you out there. As part of the transfer, all of the late Lt. Andrew Frederick’s articles resonated in a powerful way. Not just due to the quality of the writing, but also because of his legacy and the relationship he developed with the Fire Nuggets family. While speaking with brother Brian Brush from Colorado about all the ideas we have and goals we aim to accomplish in the next couple years, the topic of funding, or rather lack of funding, was broached. Brother Brush suggested that we hold a fundraiser to raise some capitol to support the re-launch, which thus far has been paid for by our I.A.F.F. Local 1227 and by Union Centrics. Within a short period of time a T-Shirt and beanie design came together and is now ready for purchase. Fire Nuggets has always been a non-profit organization in spirit and action. The founders were dedicated to providing high-quality, low-cost educational opportunities to all of us in the fire service. We plan to continue this mission and we want to strengthen that pillar by securing 501(c)4 status for Fire Nuggets, which should be completed by early 2014. That said, we need your help to get back off the ground. All of you are the reason Fire Nuggets has thrived for over a decade, and all of you will be the reason it continues. 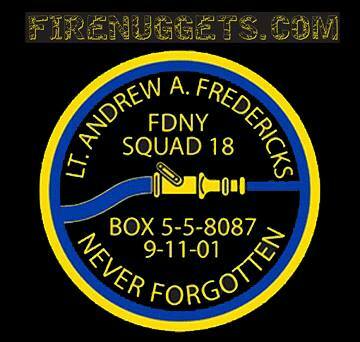 Please purchase a shirt and beanie to both remember a great fireman, educator, Fire Nuggets contributing author – and to support the resurgence of a great resource to the international firefighting community. Items are available from November 11th through November 20th, 2013. You can click here to visit the online store.